Here is portrayed a real-life experience. 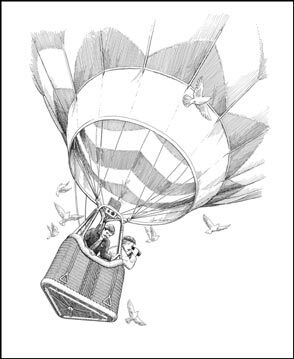 As romantic and daring as this may seem, it has often been enjoyed by the artist during his experience as a commercial balloon pilot. The almost spiritual feeling one gets being borne aloft on the wind to be in the quiet company of birds and clouds is indeed the stuff of many dreams. To fly effortlessly with only the air between you and your craft and to know the most subtle changes in weather and wind patterns as a matter of necessity, is one way of becoming intimately acquainted with how Nature works her magic. There is simply no other craft that allows this kind of interaction with our world and the sky. Drifting down occasionally to trim out the balloon descent and brush along the tops of trees in some quiet woods, is only one of the many amazing sensations one can experience in a balloon. To the common observer on the ground this seems as though it is the sport of heroes and brave adventurers, but it is actually now a very common activity. Imagine being able to talk to or hale those on the ground as you gently drift overhead, hearing the sounds of other voices and those of crickets, flowing streams, and the thud of deer hoofs in the woods below. These are but a few of those wonderful things you, too can know if you ever decide to have the experience.